Serving the Central Valley and entire Bay Area. Use our online form to schedule a pickup by our professional team. Visit our services section to learn more about what e-waste we will accept. Bring us your e-waste for cash! That's right, bring your e-waste to us in Stockton and we'll pay you cash. E-waste needs to be recycled and it doesn't matter if it comes from a home or a business. Text our local number 209-463-7600 to Schedule a pick-up. Free pickup with 3 qualifying items. See Schedule A Pickup form for details. Drop off your old electronics to use in exchange for cash. 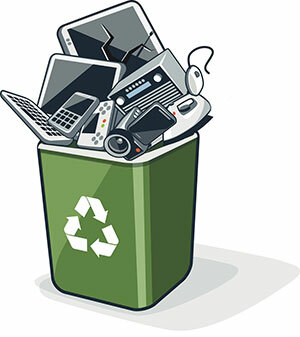 We accept the following items for e-waste recycling: Computer Monitors, Laptops, Computers, Copiers & Printers, Projectors, Medical Equipment, Lab Equipment, CRT Screens, Televisions, LCD Screens, PCB Boards, Faxes, Calculators, Stereo Systems, Cell Phones, IT Equipment. You can schedule your pickup with us online!